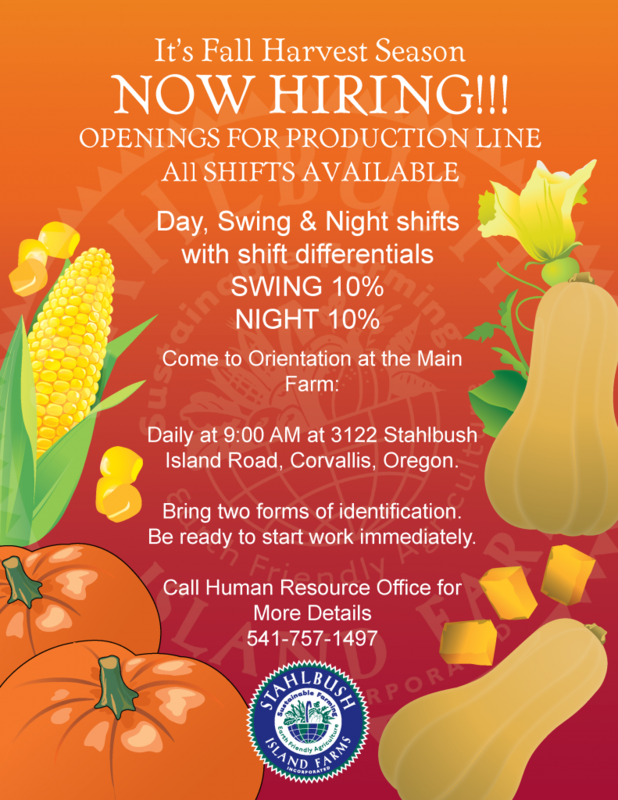 Management of the Marketing Department at Stahlbush Island Farms, its public relations strategy and the delivery of social media campaigns ensuring organizational values, ambitions, and goals are achieved. Coordinate marketing campaigns with both the Industrial Sales and Retail Sales Teams. Creating, planning, and implementing promotional campaigns for the Retail Sales Team. Managing, create, and post relevant content to all websites and social media. Monitor all social media accounts. Creating new packaging designs, maintaining existing packaging. Drafting communication to the company and consumers. Writing press releases, responding accurately to reporters and media. Report directly to the Director of Industrial Sales & Marketing. The mission for this position is to coordinate the retail line of goods from distribution to invoicing, as well as provide customer service to both our internal and external customers. Confirm PO’s including but not limited to: ETA, CPU and product availability. Process orders in a timely manner. Create releases for each PO to send to warehouses. Organize and maintain hard copies and electronic documentation supporting order fulfillment, distribution, pricing and contractual obligations. Maintain accurate retail product inventory and assist with monthly reconciliations to outside warehouses. Process retail invoices accurately and timely. Provide customer service as needed to Sales team as well as outside customers. 1 year of experience in accounting or data entry preferred. Great attention to detail and ability to process information quickly and accurately. Broad range of computer knowledge including MS Office Suite applications. Leadership skills, integrity, and commitment to professional responsibility. A self-starter with the ability to handle multiple tasks simultaneously and set priorities. Good report writing, presentation and interpersonal communication skills. The mission for this position is to guide and manage the overall provision of Human Resources services, policies, payroll and recruiting programs for Stahlbush Island Farms, Inc. Prepare, recommend, and maintain records and procedures for controlling personnel transactions and reporting personnel data. Propose, publish and administer personnel policies. Maintain knowledge of employment law through seminars, written information and associations to be able to guide management and insure that company remains within legal guidelines. Administer the company’s benefit programs, which include medical/dental, 401(k), group life insurance and AFLAC. Responsible for the timely processing of eligibility, contributions and billing for employee benefit programs. Obtain bids upon renewal of benefits and confer with management regarding benefit costs. Managing an effective recruitment program for both seasonal and full-time professional staff. Coordinate recruitment efforts with managers. Maintain high visibility of the company as an “employer of choice” by attending career fairs and other recruiting events, working with educational institutions and other community organizations. Assist managers with employees’ training and development and performance management. Investigate and resolve employee issues. Facilitate communication between labor and management including translation and interpretation. Administer classification programs which include classifying positions and writing job descriptions. Monitor unemployment claims and assist managers with appeals. Maintain an extremely high level of confidentiality. This position has been identified as holding responsibility for food safety and quality of the company. This responsibility extends over all shifts. During absence, the following position serves as coverage to this position: Chief Management Officer. Bachelor’s Degree in the field of human resources or related field, eight to ten years of experience in human resources or any combination of experience and training that provides the required knowledge, skills and abilities. Experience in employee relations, recruitment and selection, HRIS, compensation and benefit administration. The mission for this position is tofollow guidelines and legislation as standard under food quality and safety laws and Audit Schemes. Ability to research and interpret new legislation, guidelines, theories, labs, equipment; and to create and implement policies that follow with this research. Communicates with customers, drivers, and other SIFI employees with a customer service focused mindset. Minimum of 3 years of increasing food industry experience in QA. Must be a strong problem solver, able to create solutions to challenges in an expedient manner. The ability to multi-task and prioritize assignments is essential. Strong computer skills are important. Proficiency in understanding and use of personal computers, Excel, Word, e-mail and 10-key skills required. Have flexibility and availability for evening and weekend work when situations arise. Confirms PO’s including but not limited to: ETA, CPU and product availability. Request bids for freight, and secure freight. Arrange freight of ingredients to co-packers, freight of finished goods from co-packer to warehouse, freight of finished goods from warehouse to warehouse. Enter freight transfers in to internal system. Processing orders in a timely manner as needed. Creating releases for each PO to send to our warehouses. Create product releases for freight company, warehouse, and receiver. Maintain accurate inventory in two systems. 1 year of experience in logistics or data entry preferred. Broad range of computer knowledge. Systems and users information requirement analysis skills. Good report writing, presentation and communication skills. Strong interpersonal, verbal and written communications, teamwork and partnering abilities. Demonstrate computer skills in MS Office Suite applications, including Word, Excel, and Access. The mission for this position is to conduct, maintain, test, and repair electrical/electronic, mechanical, hydraulic, and pneumatic systems and components. Apply knowledge of electrical/electronics and mechanical principles in determining equipment malfunctions and applies skills in restoring equipment to operation as required to keep plant and equipment functional to meet needs of the food processing plants and farm operations. Equipment maintenance and repair – diagnose problems, codes, execute necessary repairs. Prepare and set up machinery for scheduled production runs. Perform mechanic skills including, but not limited to, mechanical, electrical, pneumatic, and hydraulic troubleshooting and repair of production machines. Read and interpret equipment manuals and work orders to perform required repairs, maintenance, and service. Provide emergency/unscheduled repairs of equipment during production. Diagnose problems, replace or repair parts, test, and make adjustments. Detect any faulty operations, defective material, and, and report those and any unusual situations to proper supervisor. Provide routine information to and solicit situation specific information company wide from employees, managers, and external relationships and general inquiries. Three to five years of verifiable experience or any combination of education, experience, and training that provides the required knowledge, skills, and abilities to handle the position. Degree or certification in mechanical, electrical, and industrial maintenance a plus. Mechanic/Electrician Oregon Building Codes LME or LMPJ license. PLC and food processing experience a plus. NH3 refrigeration experience desirable but not required. Strong troubleshooting in electrical and mechanical skills required. Flexibility on work schedule to meet requirements of harvest; swing shift position. The mission for this position is to perform maintenance and repairs on plant and refrigeration equipment as required keeping plant equipment functional to meet needs of the food processing plants. This position is night shift 10pm-6am. Perform routine and preventive maintenance as needed and/or assigned for the purpose of ensuring the ongoing functioning of refrigeration systems. Prepare documentation for the purpose of providing written support in compliance of regulations. Perform troubleshooting, repair, and preventive maintenance on refrigeration equipment and plant equipment. Equipment maintenance and repair – diagnose problems, codes, execute necessary repairs, change fluids and filters as needed when time for service, test and setup. Oversee the work of others with respect to ammonia refrigeration. Ability to teach and train other members of the maintenance team. Detect faulty operations, defective material, and report those and any unusual situations to proper supervisor. Provide routine information to and solicit situation specific information company-wide from employees, managers, and external relationships and general inquiries. Any combination of education, experience, and training that provides the required knowledge, skills, and abilities to handle the position. Degree or certification in mechanical, electrical, or industrial maintenance a plus. Three to five years of verifiable experience repairing and maintaining equipment and machinery; prefer experience in food processing environment. Minimum of 2 years combined experience with anhydrous ammonia. RETA CIRO certification or RETA CARO certification with commitment to obtain CIRO certifications within first year of employment. Must demonstrate an understanding of operating principles governing refrigeration process. The mission of this position is to maintain order and movement of raw and finished product and supplies in to and out of the all storage warehouses and freezers areas. Includes loading and unloading product for inbound and outbound shipment from the docks. Operate SIFI forklifts in compliance to all Safety policies and procedures at highly proficient level. Transport finished product from freezer or warehouse locations stacking pallets and racking vertically. Load and unload finished product into and out of transportation carriers. Familiarize and understand Dock Standard Operating Procedures and Products and Coding. Fill orders and pull product to support customer and plant processing needs. Flexibility for Day, Swing and Graveyard shifts as required. Ensure that all product and merchandise is not damaged and stored correctly. Work inside, outside and within freezer space and coolers consistently on a shift basis. Equipment maintenance & repair-Diagnose problems, codes, execute necessary repairs; change fluids & filters as needed when time for service; test and setup. Ensure compliance of documentation on inventory and packaging. Understand and process logistics documentation, compliance, and bill of lading documents. Three to five year forklift experience required. Must pass written and driving forklift certification prior to hire date. Some basic computer data input ability. At Stahlbush, we hire ages 16 and up for general labor on the farm. Tasks may include harvesting and weeding. Interested individuals should report to the main farm at 3122 Stahlbush Island Road for open orientation. Every day at 9:00 a.m. The mission of this position is to perform maintenance and repairs on plant equipment, farm equipment, service trucks, vehicles, etc. as required keeping plant and equipment functional to meet needs of the food processing plants and farm operations. Service and repair construction equipment, forklifts, spreaders, sprayers, harvesters, diesel engines and all types of equipment/implements; all equipment and machines necessary for operation of food processing plants. Performs mechanic skills including, but not limited to, mechanical, electrical, pneumatic and hydraulic troubleshooting and repair of production machines. Read and interpret equipment manuals and work orders to perform required repairs, maintenance and service. Detect faulty operations, defective material and report those and any unusual situations to proper supervisor. Provide routine information to and solicits situation specific information company wide from employees, managers and external relationships and general inquiries. Degree or certification in mechanical, electrical, or industrial maintenance a plus. Any combination of education, experience and training that provides the required knowledge, skills and abilities to handle the position. The mission of this position is to work collaboratively with other plant maintenance and production personnel to install, maintain, and operate plant food processing machinery in a safe and efficient manner. Understand and apply all safety standards including lock out tag out, confined space, fall protection, etc. Work in a safe manner even when no safety standards exist for the particular activity. Install and maintain equipment that is part of a puree canning line. This equipment includes retorts, palletizers, depalletizers, can loaders and unloaders, can fillers, lidders, seamers, etc. Install and maintain a wide variety of plant food processing equipment including conveyors, size reducers, sorters, washers, peelers, blanchers, heat exchangers, metal detectors, finishers, pumps, fillers, processors, and other product specific pieces of machinery. Install and maintain hardware to support the proper operation of the plant steam, ammonia refrigeration, water, compressed air and waste water systems. Complete work orders in the computerized maintenance management software system to report on work completed. Monitor and perform field inspections on equipment. Take action (report, operate, repair, fabricate, clean, adjust, etc) on field equipment and process. Maintain work area in a clean, organized and safe manner. Must be able to perform all technical aspects of the job by using all tools or systems required to perform work (MIG and ARC welders, cutting torch, plasma cutter, micrometers and calipers). Must understand and apply all administration and safety procedures throughout the plant. Requires an ability to read, understand and apply all schematics, drawings, technical publications and logic required or related to the job. Ability to solve practical problems and follow a variety of instructions in written, oral, diagram or schedule form. Previous experience operating equipment and performing maintenance tasks preferred. Automotive knowledge, repair and troubleshooting skills a plus. The mission for this position is to work as part of a Fabrication Shop team responsible for the custom construction of various complex food processing and farming equipment. Responsible for various types of weld preparation, welding and weld finishing operations to manufacture product to customer drawings, specifications, or other forms of instruction. Read/interpret blueprints, layout, fitting, cut lists, design basics, rigging, ironworking, press brake, shear, and other duties. Knowledge of wire and filler materials applications for various steel alloys, aluminum, and some exotic materials. Must be able to devise metal fabrication solutions to repair or construction problems encountered in the absence of complete plans. Must be able to use conventional and precision measuring instruments. Finish grinding applications using manual and power tools. Three to five years of verifiable welding experience, preferably in a manufacturing or food-processing environment. Must be familiar with all aspects of industrial fabrication including MIG, TIG, mild and stainless steel. Should be familiar with or willing to learn Good Manufacturing Practices and HACCP. Must speak, read and write English. Bilingual English/Spanish highly desired. Must be an experienced welder. Want to stay up to date about positions at Stahlbush? Enter your name and e-mail address below to subscribe to our newsletter!